Art + Guild Wars = Win. Guild Wars and Guild Wars 2 have always been known for having amazing art, and one of the best art teams in the industry, if not the best. Personally, I’m leaning towards the side of the “best team in the industry”, and I know I’m not the only one that thinks so. The team and its members have won numerous accolades – just last week it was announced that Daniel Dociu, ArenaNet’s art director, won the Grand Master Award from Expose 9. This is no small feat – just look at the previous winners, artists like H. R. Giger and Ralph McQuarrie. Kekai Kotaki also won a Master Award for Game Art, so there’s certainly no lack of ANet representation. Clearly, ArenaNet’s art department is full of very talented, skilled individuals. But what does that mean for us? Well, on top of having games that simply look gorgeous and have amazing concept art…there’s a lot that us artistically-inclined fans can learn as well, by studying the concept art released and how the team works! The first thing you should do is download the GW2 Asset Kit, that ANet was so kind as to share with everyone. Don’t do what I did and download only the HD one – make sure to get both! The HD kit has lovely, high-quality PSDs of a few pieces of art, but the real treasure trove is the regular one. Unzip them, take a look, and drool over the prettiness for a few minutes. You know you want to. I sure did for a while. But the real jackpot is when you realize how large some of these files are. We’re talking huge – you can zoom in to 100% and see each individual brush stroke. And that, my fellow artists and art appreciators, is awesome. That one little fact can give so much insight on how they work. And so I’ve assembled some tips, based on studying these pieces of art! 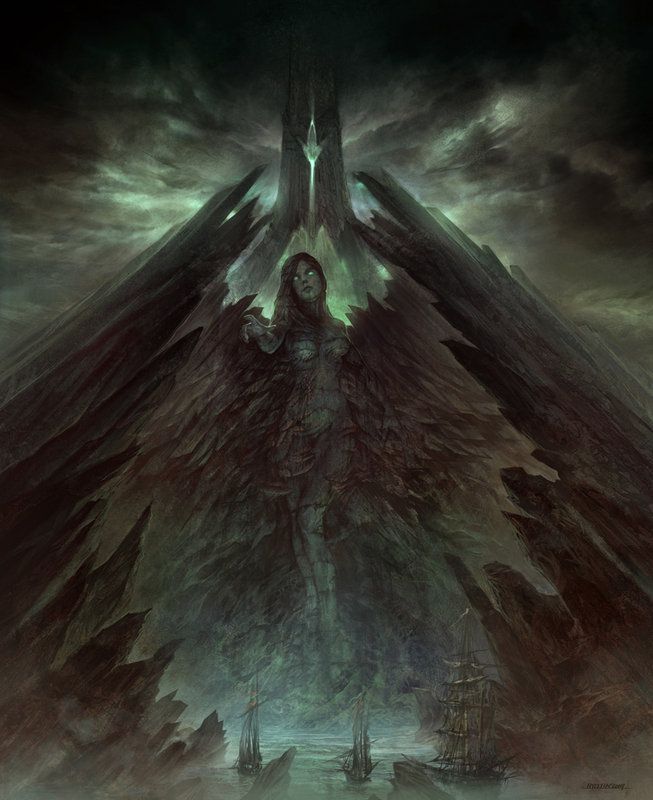 Divinity's Reach concept art, cropped and zoomed at 100%. Whoa. Work large and loose. If you take a look at a lot of the concept artwork, it’s noticeable that a lot of the detail is created by zooming out/sizing the images down. If you zoom in all the way, you’ll notice that it’s a lot of large brushstrokes, loose painting, and really not a huge amount of actual detail. 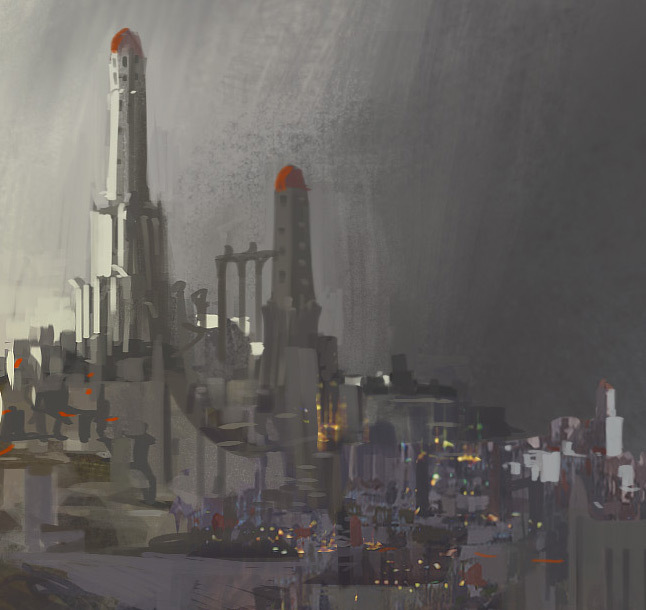 This particular concept art, showing Divinity’s Reach (it’s the one titled Divinitys_Reach_1.jpg in the asset kit) displays this very well. It’s actually a very useful way to work in general – my boyfriend studied game art and said that he was taught to work this way for painting textures – start out huge, don’t use a lot of detail, and then shrink it down and go back and add a bit more in. It creates a unique look, one that seems to be very detailed but really isn’t, and also means that you’re not as likely to get burned out on painting while still halfway done because you’ve been going nuts trying to get the little details right. It also allows you to make changes more easily as you have less work to redo if you change your mind. Don’t be afraid to start over if it’s not working out. As I’ve touched on in a previous post, ArenaNet uses an iterative working process while creating their games. If something doesn’t look right, they redo it until it does look right. Now, I know this is something that a lot of artists are loathe to do; art is rather time-consuming, and it can be kind of upsetting if you’re working on something and you just can’t get it to look right. I know this certainly bothers me quite often. But if you simply can’t get it looking how you want, or looking good, or whatever…don’t be afraid to scrap it. Maybe something with the initial sketch was off. Maybe it’s something that is out of your reach right now – while it’s always good to push yourself to try new things, don’t feel bad if you hit a wall. Maybe it’s what you’d like to do right now, but your artistic muse has other ideas. So, don’t be afraid to just scrap it! Try starting over. Redo your sketch. Try it from a different angle, maybe. Or just set it aside and work on something else for a while. It’s okay. Everyone has this issue. I can’t even count how many scrapped pieces of art I wind up for each painting or manipulation that I finish and am happy with. I’m not saying to give up – the opposite in fact! Just keep to working at it, and restart if you feel you need to. Work outside of the box! If you have an idea and it seems weird or random…just go for it. Who’s to judge what you’re working on? Some of the coolest things can come from a spur of the moment idea, or something unexpected. 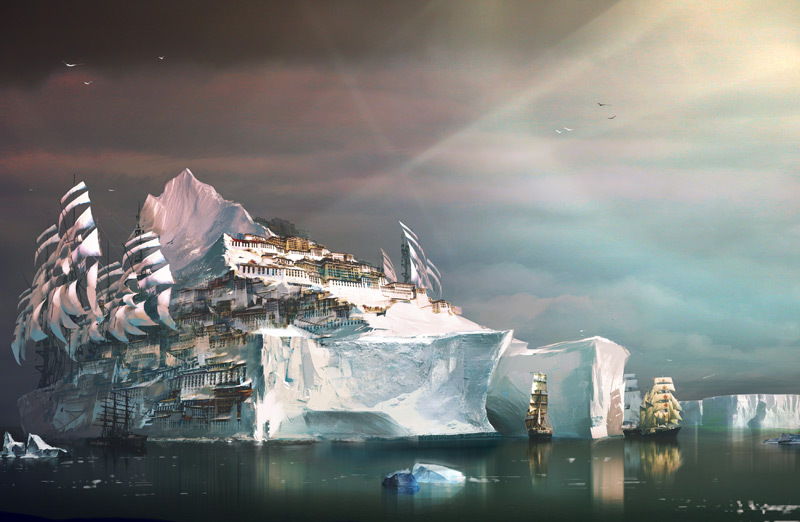 For example, in Guild Wars 2, the kodan race came from two different concept arts (an armored bear and a building/monastery built into an iceberg) that the developers, upon seeing, decided were so awesome that they had to work them into the game somehow. And hence, everyone’s favorite 10 feet tall spiritual armored polar bears were born. This doesn’t mean that, if you have something in specific you have to create, that you should completely ignore that and do whatever you want. But if you’re just drawing for fun, or are just given very loose instructions, don’t be afraid to follow a whim. You may be very pleasantly surprised at the results. There’s so much other stuff that we could potentially learn from ANet’s artists – I know I’d love nothing more than to see a livestream of how Daniel or Kekai work. That would be amazing! And I’m sure there’s plenty more that I could have written about here. But I think these are the three biggest tips that can be pulled from simply looking at the end results, and are things that can help all artists. Also, don’t forget the fact that the GW communities have a large number of fans that are artists! There are active art forums on both Guild Wars Guru forums – Nolani Academy on GWG, and Library of Whispers on GW2G. You can see some really amazing art by poking around those forums, of a large variety of styles. So come and join in and don’t be afraid! What a community SHOULD be. A game’s community can be either a huge strength for the game, or something that counts heavily against it. When it comes to online games and MMOs, the community is especially important, possibly more than many people realize. Some games have an absolutely terrible community, which can put people off before they even start playing. Other games have a great community. Most tend to fall in between, and have some bad apples, and some awesome. Things may change between now and when the game actually releases and it’s given some time to settle in, but so far, the Guild Wars 2 community is leaning mostly towards the “awesome” side of things. And I say that as someone fairly new to the whole “being part of a community” thing. I pretty much just posted on forums, but never really made any friends outside of the art forum on GWG (which is in fact a great little community-within-a-community, but Guild Wars + art will be a later topic for me to discuss). Then towards the end of last year, I saw that GuildMag was in need of people, and I decide hey, what the heck. I’ll apply. And as silly as it sounds, that was one of the smartest things I’ve done. I began using twitter more, because it made it easier to keep up with GW news and GuildMag stuff. I started chatting with some of the other people working on GuildMag, and found a few other people who looked nice and like they’d be fun to talk to. And…I enjoyed it. I’ve always been a pretty shy, quiet person, so being able to talk with people with such ease and be accepted was nice. I’ve got a nice group of friends now and we pretty much can chatter about anything – from Guild Wars info, to current news, to just general life stuff. That all started because of my love for Guild Wars and Guild Wars 2. The GW2 community so far actually has something of a very odd feel to it, but if you spend any time around sites like GW2G, you’ll see what I mean fairly quickly. The community is actually fairly large, for a game that’s not out yet and won’t be out for some time. Sometimes it can feel overwhelming trying to get into conversations on forums. But there’s also this feeling that we’re really just a small, tight-knit group of people that all like the same thing, and are all excited about it. For example, look at the number of GW2-related blogs and fansites. There are so many! When I first started up Under the Pale Tree, I fretted about – there’s so many other blogs already up and running and well-known; what chances did I have? I’m used to fandoms and communities where another blogger is simply seen as competition for your hard-won readers. But that’s not the case here. Rather, it’s more of a “the more the merrier!” mindset. Even with the limited info we have now, and the fact that anything new released will spawn dozens of blog entries, everyone is going to have their own interpretation. Everyone is going to have different ideas, different things they’re speculating on, different opinions. And so instead of competition, it’s friendship. ArenaNet themselves and their hand in this can’t be forgotten, of course. Take, for example, the recent community open house that they held. How many other developers would do such a thing? I honestly can’t think of any. The contests they hold, both for GW1 and now GW2, encouraging fans to exercise their creativity. They openly admit to reading forums, and I know they like reading what their fans have to say about the games on blogs. Even just chit-chatting on twitter. They don’t do what a lot of game devs do, and hide away as faceless beings controlling everyone’s fates. And the way they approach their games with such love, excitement, and determination to make the best damned game they can…as a fan, it’s hard to not get excited. Things may change as the game releases, and the community suddenly expands very quickly. But I hope the core of what the GW2 community is and how it started out remains. Because damnit, this is how a game’s community should be, and I love being a part of it.